Remember John McClane? Well, there may not be any semblance of the iconic character portrayed by Bruce Willis in “A Good Day to Die Hard” the fifth movie in a series that often feels some of the like a cheap imitations that have been made since the original “Die Hard” was released back in 1988. That movie is now available after its disappointing theatrical run. The Melissa McCarthy/Jason Bateman crime comedy “Identity Thief” actually fared better, appearing at number one at the box office during its opening weekend as well as its third week out (which is quite rare). This means there’s still an audience for a raunchy and mean-spirited movie from the director of “Horrible Bosses”. How about a zombie love story? Jonathan Levine (“50/50”) fills the void in the zombie rom-com sub genre with “Warm Bodies” an odd and delightful love story told from the perspective of the undead. Now there’s a twist. 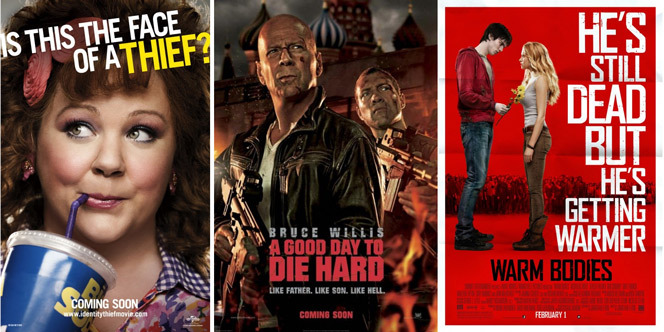 These three movies couldn’t be more different from each other, which should provide some entertainment to a wide variety of viewers. There are other notable releases out this week, such as “Brooklyn Castle”, a recent doc about a group of middle schoolers in Brooklyn who unite and thrive as they take part in a celebrated chess tournament. Another recent release is “Escape From Planet Earth” an animated feature that pretty much bombed in the theaters. No wonder. It looks quite dumb and unfunny. New to Blu-ray this week is “The Mad Max Trilogy”, the post-apocalyptic series directed by George Miller that made Mel Gibson’s career. Think what you want about Gibson, but like Willis made McClane a fan-favorite character, so did Gibson with Max.